July 6, 1927 - December 15, 2017 - Pat was an excellent seamstress, very crafty, could 'fix' just about anything, loved gardening, shopping for treasures at garage sales, baking apple pies and making applesauce! Patricia Ruth Rivenes (Randall), age 90, died on December 15, 2017. Patricia (Pat) was delivered by her grandmother in their farmhouse near Haddam, Kansas on July 6, 1927. They later moved to the "Little Rock Farm" south of Throop, Kansas. Throughout the years, she recounted many stories of attending a one-room school house for 8 years, life on the farm during the depression, raising turkeys, blizzards, sleigh rides, grasshopper infestations, drought and more. When she was 13, her parents auctioned off the farm, loaded up their truck and headed for Woodburn, Oregon. There, her father would manage a wooden ladder factory. 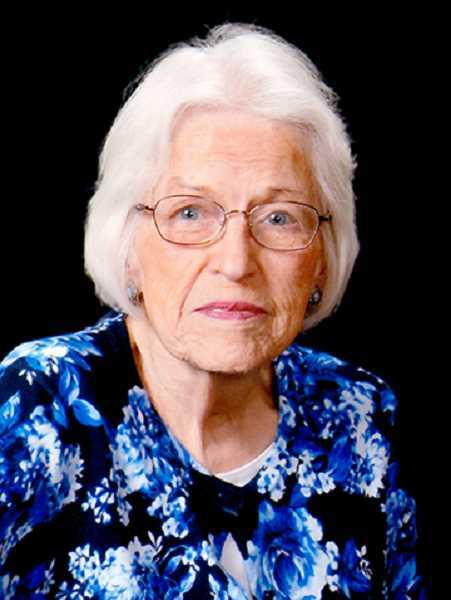 She graduated from Woodburn High School in 1945 and completed one year at Oregon State College (now OSU). It was about this time that she met the love of her life, Mike Rivenes, who just happened to be working for her father. They were married on June 20, 1948. Together, they opened "Mike's Market" in Woodburn, on the corner of 99E and Mollala Hwy. In 1953, they closed the store and moved their stock to a store that her father-in-law (Oscar) owned in Hubbard. It became Rivenes Hubbard Market. About 1957, Oscar retired and brother-in-law, Paul Rivenes bought into the store. Throughout the years, Pat played a major role in running the business, in addition to other jobs she may have had during the time. Pat worked for many years as a childcare provider for over 100 children. She is still lovingly known as "Mama Pat" by many Woodburn residents. In the early 70's, she worked for Doctor Delbert Reed as a receptionist and later, Doctor Cleon Miller until her retirement in 1995. Pat was very creative! Many do not know she played the piano, beautifully. She was an excellent seamstress, very crafty, could "fix" just about anything, loved gardening, shopping for treasures at garage sales, baking apple pies and making applesauce! She enjoyed volunteering with the Willing Workers (quilters) and being involved with the church that she loved, Immanuel Lutheran in Woodburn. She delighted in taking trips to the beach, camping, going for drives, and most of all family time! She will be remembered for her sense of humor, work ethic, and being a strong moral compass for all of us. Pat and Mike had 3 children: Christine Hindman of Woodburn, OR, Diane (Stan) of Lynnwood, WA, and Michael (Shelly) of Woodburn, OR. She had 8 grandchildren, Erik Hindman, Megan Walker, Brian Bernard, Sarah Bernard, Kevin Bernard, Erin Crock, Jennifer Rivenes and Whitney Rivenes. Pat also delighted in having 10 Great-Grandchildren. Pat was preceded in death by Mike Rivenes (husband) in 1997 and parents , Russell and Betty Randall. Pat was an only child. A funeral was held on Dec. 21 at Immanuel Lutheran Church in Woodburn. In lieu of flowers, contributions may be made to Immanuel Lutheran Church or Little Lambs Preschool.